After narrowly losing out against group favourites Belgium, Algeria showed what they were capable of by completely outplaying South Korea. Russia had also only just lost out against Belgium, but a draw against South Korea kept them in with a chance of qualification. A draw would see Algeria through, but Russia could gain the qualification they didn’t really deserve if they scraped a win. 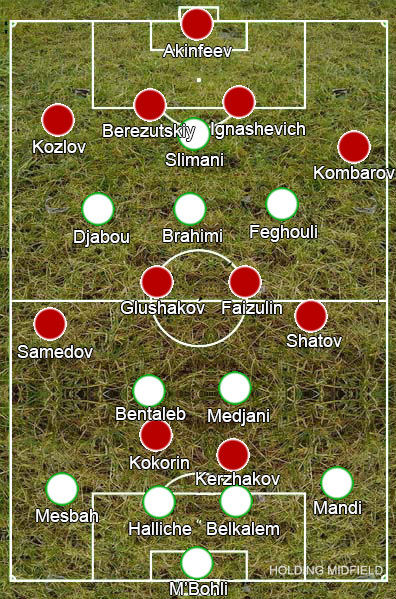 Essaid Belkalem replaced Madjid Bouguerra, who was one booking away from a suspension, in Algeria’s 4-2-3-1, while Fabio Capello changed to a 4-4-2, finally starting Aleksandr Kerzhakov in place of Maksim Kanunnikov as Oleg Shatov was shunted out onto the left and Dmitri Kombarov overlapped. Russia got the goal they needed within six minutes, when Aleksandr Kokorin scored a fantastic header from a first-time Kombarov cross. They were somewhat fortunate though, as the left-back was free to venture forward due to right-winger Sofiane Feghouli having to get treatment for a gash on his head that kept opening up throughout the first half. Nevertheless, they had the lead they needed and it was now up to Algeria to break them down. The narrow attacking midfield trio attempted the same nice interplay that had been so successful against South Korea, but Russia set up in two banks of four and squeezed that space between the lines to a couple of meters. While comfortable in open play, Russia struggling to defend set-pieces, yet they continuously gave them away cheaply. Eventually, Islam Slimani made them pay when he headed Yacine Brahimi’s free-kick home. The rest of the game was an afterthought. Algeria didn’t sit back particularly well, but Russia didn’t look like scoring even with the introduction of Alan Dzagoev. Ultimately, this was the result everyone outside of Russia wanted. Algeria are much more interesting and Fabio Capello’s done an awful job for the next World Cup hosts, alienating three of their best players and drafting in an ensemble of mediocrity in their place.